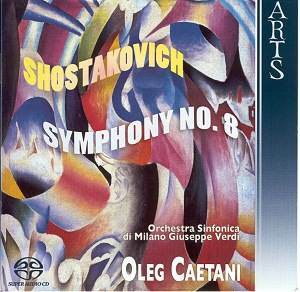 This SACD release brings Oleg Caetani's cycle of Shostakovich symphonies with the Orchestra Sinfonica di Milano Giuseppe Verdi to just past the half-way point.� The previous releases in this series have been received with acclaim in some quarters, but not in these pages (see these reviews: review1, review2 and review3).� Accordingly, I approached this disc expecting either revelation or disappointment.� Unfortunately, I experienced the latter. The problems with this performance are immediately apparent in the first movement and all stem from a poor choice of tempi.� There is certainly nothing wrong with making bold decisions about tempi - indeed, if idiomatically handled, a different approach can prove revelatory.� The problem here, though, is that by choosing tempi that are consistently quick, Caetani inevitably glosses over the rhetoric of Shostakovich's musical argument and forfeits its grim atmosphere.� The transitions - which are very hard to bring off in the first movement of this symphony, perhaps more so than any in other first movement Shostakovich wrote - are also affected by hurried tempi, and become clunky.� The orchestra struggles with the pace.� The notes are all there, but there is an unsteadiness to the wind and brass and a rasping to the string tone that is quite unattractive.� Not that the full gloss of Haitink's performance is mandatory, but any roughness or edge to the playing should be deliberate, rather than mere poor execution. Not all is bad.� There are certainly some moments that come off very well.� The big climaxes in the first and last movements sound terrifying, and here the DSD recording comes into its own.� Overall, however, not even the sonics can save this release.